9/20 Eat Wings, Raise Funds @ Buffalo Wild Wings Grapevine, 11 am – 11 pm. Have lunch there and then go back for dinner and Thursday Night Football (Jets @ Browns). We will also have our first PTA General Meeting that night at 6:00 – we hope you’ll join us! Show this “ticket” when you dine. 9/25 Join us for our monthly Dine & Donate event at Cici’s Pizza in Grapevine (2100 W. Northwest Hwy #126) on the fourth Tuesday of every month from 4 pm until closing! Our first night is Tuesday, September 25th. 10% of your order will go back to the school! If you are in a rush between activities, don’t worry, To Go orders also count! Silver Lake Staff, make sure you bring your school ID because you eat free that night! 10/15-17 Dine at Wise Guys anytime between Monday and Wednesday of next week and they will donate a portion of your food bill to the SLE Dads Club! Our Dads Club has already started planning for the Grapevine Parade of Lights and Breakfast With Santa. 10/23 Join us for our monthly Dine & Donate event at Cici’s Pizza in Grapevine (2100 W. Northwest Hwy #126) on the fourth Tuesday of every month from 4 pm until closing! 10% of your order will go back to the school! If you are in a rush between activities, don’t worry, To Go orders also count! Silver Lake Staff, make sure you bring your school ID because you eat free that night! 11/14 SLE Spirit Night @ Altitude Grapevine from 5 – 8 pm. $20 allows you to jump for 3 hours! 20% of the proceeds will come back to SLE. 11/27 Join us for our monthly Dine & Donate event at Cici’s Pizza in Grapevine (2100 W. Northwest Hwy #126) on the fourth Tuesday of every month from 4 pm until closing! 10% of your order will go back to the school! If you are in a rush between activities, don’t worry, To Go orders also count! Silver Lake Staff, make sure you bring your school ID because you eat free that night! 1/3 MAIN EVENT SPIRIT NIGHT! The kids will be getting restless and school doesn’t start back up until Tuesday, January 8th, so get out of the house and join us at Main Event in Grapevine from 5-9 pm. Just turn in your receipts (arcade games, food, gift cards, activities, non-alcoholic beverages….everything counts!) at the end of the night and Main Event will donate 20% back to SLE! We are looking for BOOSTERTHON T-shirt sponsors for 18/19! Contact Jamie Schneider by June 25, 2018. We’re so excited to host a Fun Run (powered by Boosterthon) to help our school! Boosterthon is a fun, nine-day program that combines world-class character content with a highly-profitable fundraiser. 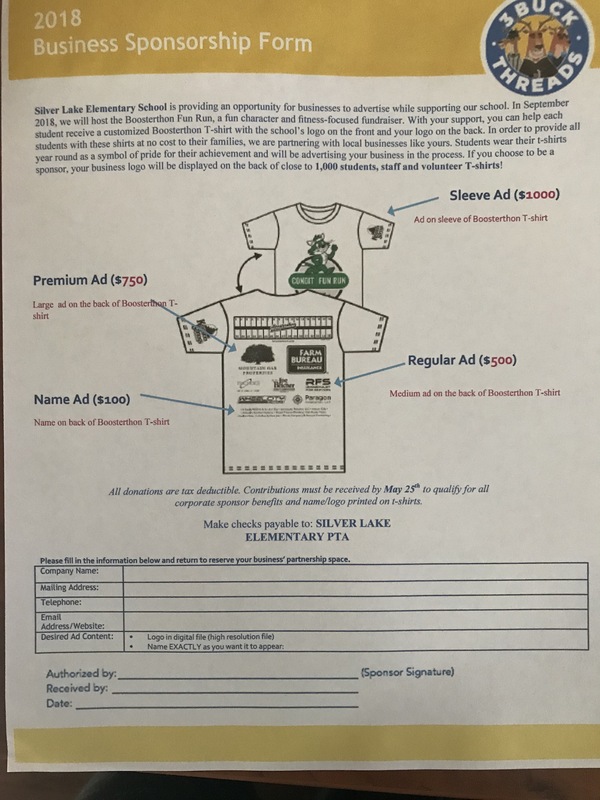 Along with this program we’re hoping to provide each student with a FREE custom SILVER LAKE ELEMENTARY t-shirt to wear the day of the Fun Run event, at no cost to the student, school, or PTA. Our goal is to raise $5000 to allow us to provide a higher quality shirt with multiple colors. In order to make this happen, we need your help! We’re hoping to partner with local businesses to help sponsor our effort. If you know of or are part of a business that would be interested in sponsoring shirts for our students, please forward them the attached sponsor form. Their name or logo will be displayed on the back of a shirt that will be worn by every student in the school. Not only will their support be helpful to Silver Lake Elementary, but also we believe it will bring more awareness to them and provide a profit in return. Parents also have a chance to sponsor the shirts and will have their family name printed for $100 sponsorship fee. We need a commitment from all sponsors by June 25, 2018 in order to supply all of our students with a shirt. Thank you in advance for supporting our school through the Fun Run! If you have any questions, please contact me at jamie.schneider13@gmail.com. Boosterthon Fun Run Final Results- $20,005 raised for SLE! The inaugural Silver Lake Elementary Fun Run on September 14th was a HUGE success! Our school goal was to raise $15,000 for Teacher Grants, Classroom Resources and Student Awards & Activities. We were able to raise a record-breaking $20,005 . – We received pledges from all over the world. Pledges came in from 36 states and 8 countries!!! Our Fun Run also came with a world-class character theme. This year’s theme was CASTLE QUEST, an English castle theme all about being brave and living with character. Students learned the “SIX VIRTUES of a TRUE HERO” from a cast of colorful characters like Muscle Mike and T-Rex Lex, attended a school pep-a-rally, earned prizes and ran up to 35 laps each during the fun run event. A special thank you to our corporate and family t-shirt sponsors that made it possible to provide a free Silver Lake Elementary Fun Run t-shirt to every child in grades K – 5. This shirt will also be used for Class Field Trips! Thanks again for generously supporting Silver Lake Elementary!